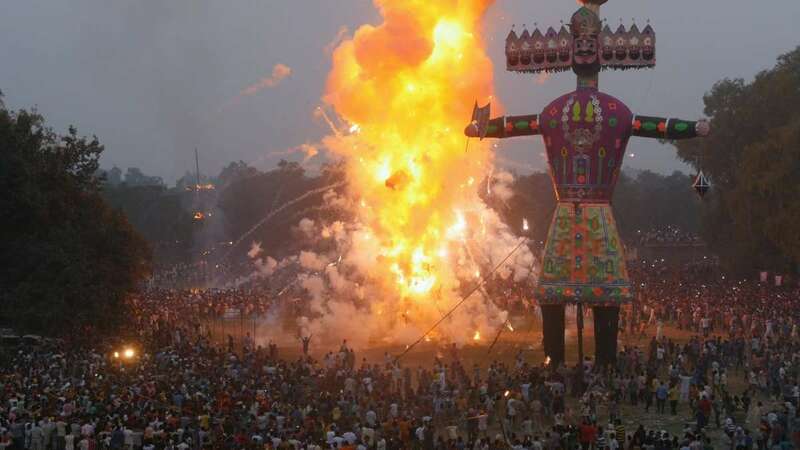 Kolkata : Thousands of devotees turned up to witness the burning of 10 effigies of demon king Ravana at a posh suburban town of Kolkata as a part of the Dussehra celebrations on Friday. Amid tight security at Central Park (Salt Lake), the effigies were torched after a series of rituals, symbolising the victory of good over evil. Organised by the Sanmarg & Salt Lake Sanskritik Sansad, the event saw a spectacular fire show and mass 'aarti' of goddess Lakshmi. Famous artists and groups (of 'India's Got Talent' fame) from various states performed during the function. "The objective of the event was to provide a vibrant interface between the citizens and the rich culture & tradition of West Bengal, " said Salt Lake Sanskritik Sansad president Lalit Beriwala.